6th May 2016 - Vega, Texas to Amarillo, Texas. We were sure we were going the right way, as there were lots of signs saying so!! We were also looking forward to getting to Amarillo as we would get to spend 2 nights in the same place - with our third rest day taken here. The great thing was that for this portion of the journey there were frontage roads on both sides of the I-40 freeway, and "locals" told us that the one on the northern side would have the least traffic. So that's the one we opted for. We had a bit of a mishap as we left Vega. It must have been rush hour as there were about 4 vehicles at the cross-roads where we wanted to turn right as we had decided to have breakfast at the local Subway. Other traffic was heading in this direction to go south towards an on-ramp to the I-40. It was a "4 way stop" scenario and I love these. You simply take your turn at going depending on your arrival at the intersection. First there goes first, etc etc etc. Sometimes there is sufficient room for a cyclist to "drift" around the corner without actually stopping - however, next to the footpath there was an unbelievably rough part of road and unfortunately Annie's foot had accidentally become cleated in. With sun in our eyes, slowing to stop, trying to avoid the huge puddle and pot-hole and then realising she was cleated in ..... she descended reasonably gently and without injury, into the gutter. The car that we were giving way to was actually the Sheriff - who slowed right down to enquire if Annie was OK. I think it is on go-pro - would love to see it one day!! ​Breakfast had, and directions taken from local staff – and we realised after 100 metres we were not going to get to the I40 frontage road heading this way. 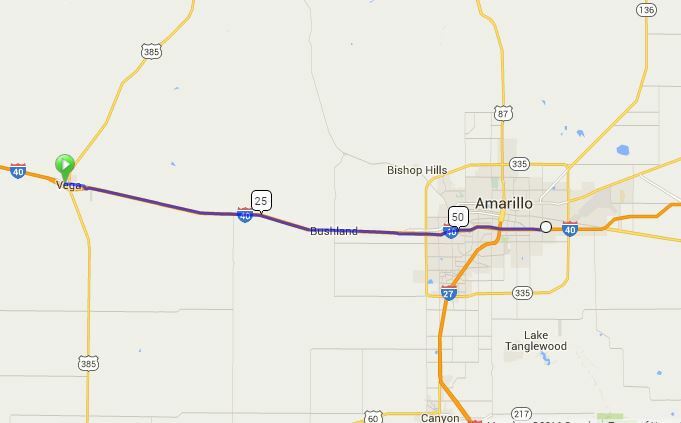 Back to our “corner” hung a right and away we went – heading to Amarillo on the northern frontage road. It seemed we had this road completely to ourselves!! It was fantastic – good surface and I think in the first 30 kms we saw about 5 cars – and what appeared to be about a dozen motorcyclists perhaps under instruction. We passed one of those HUGE farms – thousands of cows on a very small acreage – feeding out of feed troughs. It seems so sad that they don’t get to roam over some of the huge fields that are used for growing the crops they eat. I guess that is modern day farming! Our first rest stop was after 21 miles at Bushlands where we found a US Post Office so bought some stamps to put on postcards. We also crossed under the I40 to start on the southern frontage road – again nice surface and very little traffic. Four miles down the road we reached Cadillac Ranch. A line of old cadillacs “planted” in the field. Apparently some rich Texan dude did this many years ago when they were new!! They are well worn away now and basically just the paint holding them together. You can purchase a spray can as you walk in the gate and walk about 200 metres to where they are. We didn’t buy cans as the idea didn’t appeal, but other visitors returning gave us their half empty cans – and when we reached the cars – we found out we all had a little hidden graffiti artist streak – as we plastered our names, our bike names etc on the cars before we took pics!! It was fun!! We stayed on this frontage road all the way into Amarillo which is a pretty big, busy city. I think a population of about 300,000. There are several exits off and on the I40 so it was nice to be free of these. Feeling like a loo break – we decided to make it a lunch break – and had our first taste of Hooters. I don’t know why I think of Sharon Robson when I hear that name!!!! Nine miles to go so we continued on the frontage road until a tricky little part going over the railway line where we opted to go onto the I40. It was a mad house – and the noise of the traffic on the concrete roads is deafening. We completed the railway crossing and then headed back to the frontage road which we stayed on until making the turn to the Amarillo Ranch RV Park. We were lucky it was a short distance today as the south/easterly wind was pretty strong and athough a flattish ride today – it wasn’t all that easy for the last part with the strong wind. Anyway a “rest day” here tomorrow to re-charge our legs and heads, and to catch up on “house-keeping” duties! !